Justin earned a B.S. from the University of Georgia and a Ph.D. from Florida International University. 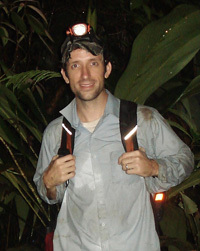 His research interests are broadly centered on conservation biology and ecological responses to environmental change. Specifically, he aims to understand (1) how major drivers of environmental change, such as land use and climate change, alter diversity at multiple levels of biological organization, (2) how local processes are linked to landscape patterns of diversity, and (3) which traits underlie the wide range of species responses to environmental change. For example, his research has examined the roles of microclimates and thermal niches in restructuring assemblages affected by disease, climate change, and habitat loss. Justin’s work in the Todd lab is focused on spatial analyses of threats to Desert Tortoise populations and global-scale analyses of amphibian and reptile responses to anthropogenic pressures. Nowakowski AJ, Frishkoff LO, Thompson ME, Smith TM, Todd BD. 2018. Phylogenetic homogenization of amphibian assemblages in human-altered habitats across the globe. Proceedings of the National Academy of Sciences. In Press. Nowakowski AJ, Watling JI, Thompson ME, Brusch GA, Catenazzi A, Whitfield SW, Kurz DJ, Suarez-Mayorga A, Aponte-Gutiérrez A, Donnelly MA, Todd BD. 2018. Thermal biology mediates responses of amphibians and reptiles to habitat modification. Ecology Letters 21: 345–355. Nowakowski AJ, Thompson M, Donnelly MA, Todd BD. 2017. Amphibian sensitivity to habitat loss is associated with population trends and species traits. Global Ecology and Biogeography 26:700-712. Nowakowski AJ, Watling JI, Whitfield SM, Todd BD, Kurz DJ*, Donnelly MA. 2017. Tropical amphibians in shifting thermal landscapes under land use and climate change. Conservation Biology 31:96-105. Nowakowski AJ, Whitfield SM, Eskew EA, Thompson ME, Rose JP, Caraballo BL, Kerby JL, Donnelly MA, Todd BD. 2016. Infection risk decreases with increasing mismatch in host and pathogen environmental tolerances. Ecology Letters 19:1051-1061. Nowakowski AJ, DeWoody JA, Fagan M, Willoughby JR, Donnelly MA. 2015. Mechanistic insights into landscape genetic structure of two tropical amphibians using field-derived resistance surfaces. Molecular Ecology 24:580-595. Copyright © Brian Todd, 2009-2018. All Rights Reserved.